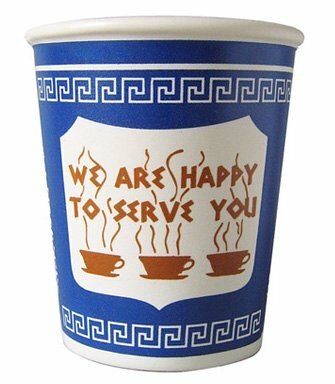 If you bought coffee at any coffee shop, diner, or deli in New York City during the past 50 years, chances are you drank it from the iconic “We Are Happy to Serve You” cup, also known as the Anthora cup. The blue, gold, and white paper cup with the Greek-inspired design was everywhere. Friendly hospitality may not be the first phrase that comes to the minds of most non-New Yorkers when they think of the Big Apple. But this ubiquitous “We Are Happy to Serve You” cup begged to differ. The cup was an instant hit when it was introduced to New York by the Sherri Cup Company of Kensington, Connecticut, in 1963. Czech immigrant and Holocaust survivor Leslie Buck, at the time Sherri Cup’s sales manager, designed the cup with its Greek theme specifically to appeal to diner and coffee shop owners, many of whom were Greek. The blue and white colors of the cup were intended to suggest the Greek flag. The centerpiece of the design is the motto “We Are Happy to Serve You” set in gold Greek-styled lettering, above three steaming, golden cups of coffee. The cup also features a Greek urn, or “amphora,” on each side. Due to this design, the cup became known as the “anthora” cup. 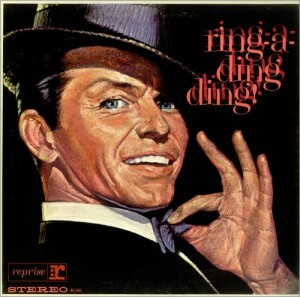 The name is attributed to the late Mr. Buck’s pronunciation of “amphora” with an Eastern European accent. 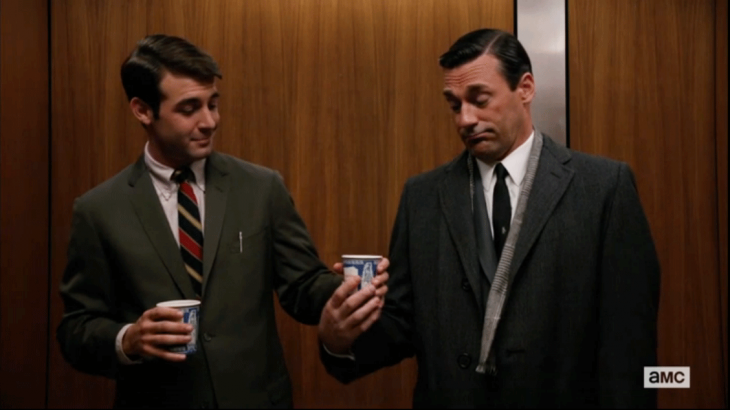 The ambitious Bob Benson (James Wolk) offers Don Draper (Jon Hamm) coffee in an Anthora cup in the Season 6 premiere of Mad Men, set shortly after Christmas in 1967. The cup’s popularity lasted for decades. Anthora cups have been prominent props on TV shows set in New York City, including “Law and Order,” “House M.D.,” “Suits,” “Person of Interest,” and “Mad Men,” as well as in movies featuring scenes of the Big Apple. In 2012 The New York Times included the “We Are Happy to Serve You” cup among the 50 objects that best embody the history of New York. 500 million of the cups were sold in 1994. By 2005, sales were down to 200 million, and a few years later, the Solo Cup Company, which had acquired the Sherri Cup Company, stopped regular production. But the company continues to manufacture them on request. The world’s most recognizable coffee cup is now available as a 10-oz ceramic cup too. Microwave and dishwasher safe, the ceramic anthora cup reproduces all the detail of the paper original. It’s the perfect gift for a New Yorker or ex-New Yorker, or for anyone who just loves New York. Or, for a party with a New York flavor, the 10-oz. Solo paper cups with lids can’t be beat. Margalit Fox, “Leslie Buck, Designer of Iconic Coffee Cup, Dies at 87.” The New York Times, April 29, 2010. Accessed online on February 10, 2013. Sam Roberts, “A History of New York in 50 Objects.” The New York Times, September 2, 2012. Accessed online on February 10, 2013.